God absolutely hates violence, intimidation, or any means used for the powerful to control, manipulate, or hound those who are weaker. 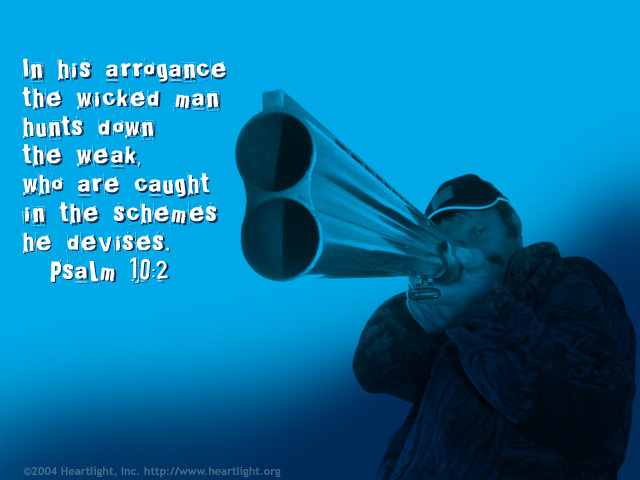 He loathes wickedness that is based upon the strong and the mighty preying on the weak and powerless. We should, by our actions and resources, demonstrate both to the weak and the powerless that there is a God of love. Give me a heart, O God, that disdains the abuse of power and the misuse of wealth. Thank you, dear God, for sending Jesus to save me when I was powerless to bring about my own salvation (Romans 5:5-11). Please give me a heart like Jesus when I see others being taken advantage of. In the name of my Savior, Jesus, I pray. Amen.